This four week workshop is focused on creative nonfiction, on writing that connects our interior world with the world we share with others. Our time together will be focused more on the product than the process; lighter on weekly lessons and heavier on the back-and-fourth editing and revising, so that participants finish this four weeks with two complete, polished pieces. Participants can expect one short writing lesson posted each week, writing prompts, and four pre-recorded writer interviews with women who are balancing their craft and their family as they publish beautiful work across various genres (interviews have been recorded specifically for this workshop). The majority of our time will be spent working as a group directly on two essays. Katie Blackburn lives in a little corner of the Pacific Northwest and is a teacher, writer, dreamer, and reader. She had three kids in three years, which makes her a tired mama saved by grace and cold brew coffee. 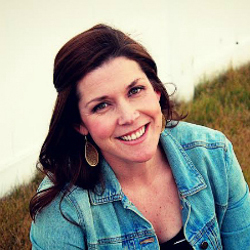 She writes about motherhood, friendship, justice, community, and finding Jesus in all of it at Just Enough Brave. You can read Katie's C+C essays here.